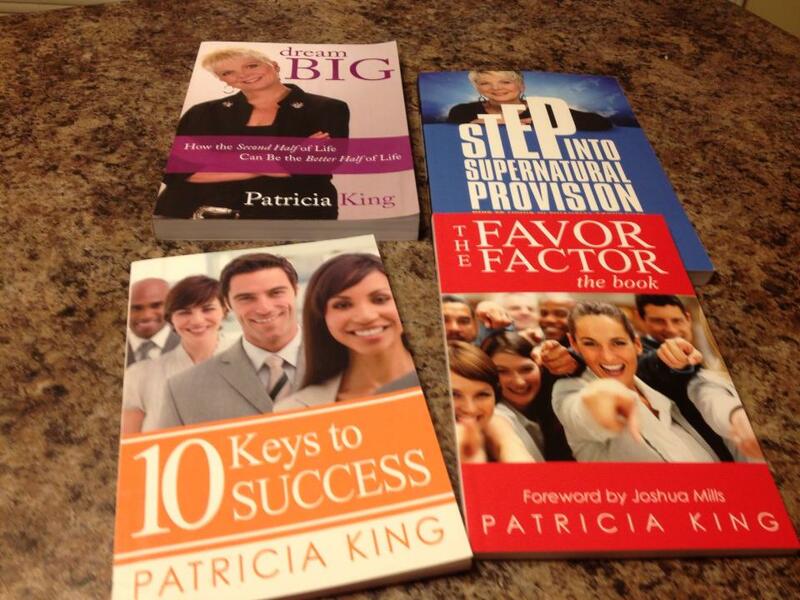 This weekend friends blessed me with a free ticket to the Glory School with Speaker/Author Patricia King, and to my delight, I won one of her books at the very beginning of her presentation! Right after Patricia shared about the book, my hand shot up and she said, “You want it?” and walked toward me. I was exuberant and hopped out of the seat quickly to get it. This was just one of the blessings from this weekend. One of the keys to walking in God’s glory which Patricia shared about was generosity. The generous will be blessed. (Proverbs 22:9). Generosity unlocks God’s blessings and is a key to accessing the glory of God. This was a live, sincere demonstration of what she taught. My friend Ruth quickly got me the book, Dream Big (one of my life mottos, especially now with my upcoming Africa trip!). I also got The Favor Factor and Step Into Supernatural Provision. I estimated Patricia had well over $1,000 – and perhaps $1000’s – of products on the back tables, including books, audios, CDS, and DVDS. She said she has given away a car, she gives away her clothes about every 6 months, and she sows financially into many other ministries and charities. Patricia exhorted us several times not to be stingy and “not to hold hands with a stingy person.” It can lock up your blessings from God, and lead to poverty. Stinginess is the opposite of God’s loving heart of giving. Do you have the gift of giving? Are you generous or do you struggle with holding onto money (or your love, time, or spiritual gifts) tightly? Would you like an opportunity to give and further God’s kingdom here on earth? You can give to my GoFundMe donations fund for my trip to speak at a women’s conference in Kenya, Africa in December 2013. This is good soil to sow into. You’ll be partnering with God and me to make an impact globally. Just click here to learn more or donate. No amount is too small or big.